Smile Clinic offers teeth whitening to lighten the shade of enamel and dentin of your natural teeth and give you a bright smile you always wanted. 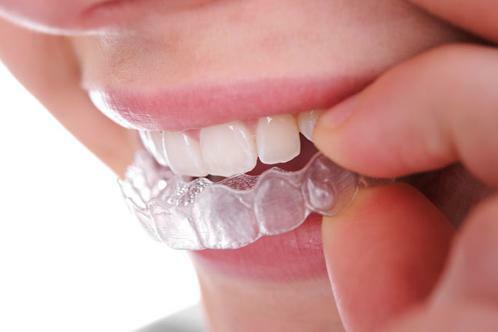 We will provide you with a custom-made teeth whitening tray and the latest in natural teeth whitening technology. You will smile with whiter and brighter teeth and increased confidence. The teeth whitening process uses a peroxide-based gel retained in a custom-fitted appliance that is worn over your natural teeth. The most common reason for discoloration is due to aging and staining substances such as: coffee, tea, Coca-Cola, tobacco, and red wine. Anyone with natural teeth will see improvements! Our denturist can determine if you require teeth whitening by doing a thorough examination. Tooth whitening is ideal for people who have healthy, unrestored teeth. However, this process will not whiten dentures, crown and bridge, composite restorations or natural teeth darkened by trauma, tetracycline or nerve degeneration. The whitening process is most effective on mildly discolored teeth. Darker stains take longer to respond to the gel and may not respond to whitening treatments. The degree of whiteness will be different from person to person. How long will it take and how long do the results last? Ask our Denturist for guidelines on proper usage of whitening material and the number of applications required for best results. Results may vary depending on your dental health and natural teeth colour.